While it’s truly a year-round destination, depending on your preferences in weather and the activities and wildlife that particularly interest you, there are a variety of things to see and do at different times of the year. We’ve broken it down month by month, so you can decide when the best time to visit the Galapagos Islands is for you. 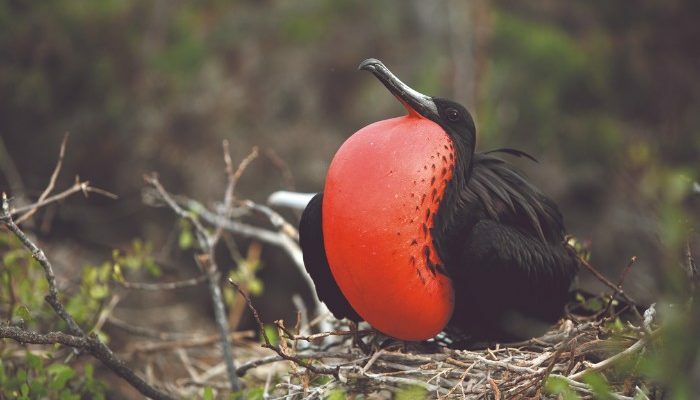 If you love tropical weather, consider starting the year with a trip to the Galapagos Islands. Prepare for hot and humid weather, with temperatures reaching about 29˚C and the possibility of rainy afternoons. It’s a great time of year to snorkel or dive, thanks to the warm water. January is the beginning of egg-laying season for the giant tortoises and green sea turtles, so you may be lucky enough to spot females nesting on the beaches. If you’re a bird-lover, it’s also nesting time for a variety of birds, including the blue-footed booby and white-cheeked pintail duck. The weather is similar to January, although the water temperature may rise a few more degrees, making it even more appealing to get your bathing suits on and explore the underwater world. While it is the sunniest month of the year, it will be interrupted with short bursts of rain, so a raincoat is essential. Keep an eye out for iguanas nesting on the sandy beaches of Santa Cruz, the giant tortoises and green sea turtles are still nesting and you might even see the flamingos mating. It’s also the time of year that you’ll see penguins migrating from Isabela and Fernandina to Bartolome. It will still be steamy and warm in March, but it’s also the wettest month of the rainy season. However, the weather means that everything under the sea comes alive, with vibrant colours and stronger water currents. This is one of the last months you’ll catch a glimpse of a female green sea turtle on the beach, as their nesting season draws to a close. It’s mating season for the frigate birds on San Cristobal and Genovesa and the waved albatross will arrive on Espanola Island (the only place they can be found). The wet season is coming to an end which obviously means less rain, but also clearer, calmer waters for those who like to snorkel or dive. Temperatures in the air and the water will still be warm, hovering around the 30˚C mark. The waved albatross will have finished their migration to Espanola, so you’ll have the chance to see them nesting. But most importantly, the giant tortoises will have finished hatching, so you can watch the babies dig their way out of the nesting burrows to the surface. Similarly, the baby green sea turtles will be making the dangerous crossing from the beach to the water, doing their best to avoid the beady eyes of circling hawks. Some people say that May is the best month for weather in the Galapagos Islands. It starts to cool by a few degrees, but the water remains warm enough for swimming. Keep in mind that the nights can get chilly (especially on a boat), so swap the rain jacket for a warmer coat. 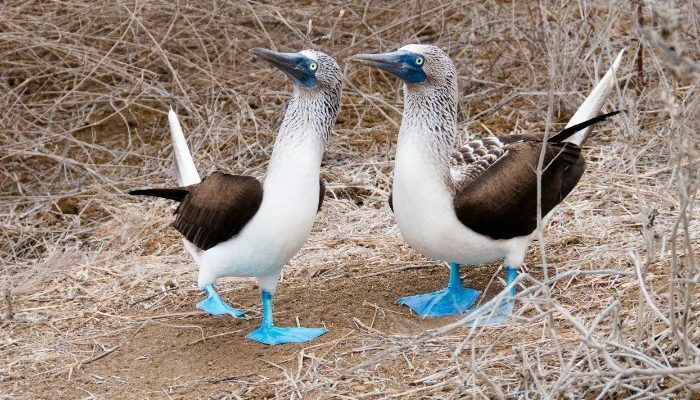 The blue-footed booby mating season is in full swing (literally, as it includes an adorable courtship dance), so this is a real highlight. The waved albatrosses on Espanola will have finished laying their eggs, so you can see them carefully nesting to protect them. The weather in June starts to get cooler, but temperatures are still warm and balmy in the mid-twenties. There is little to no rain and less humidity and you should be treated to clear, sunny skies. This is the month for whale lovers. Majestic humpback whales can be seen migrating from the south, past Peru and mainland Ecuador. And if you travel further north, you may even encounter whale sharks. 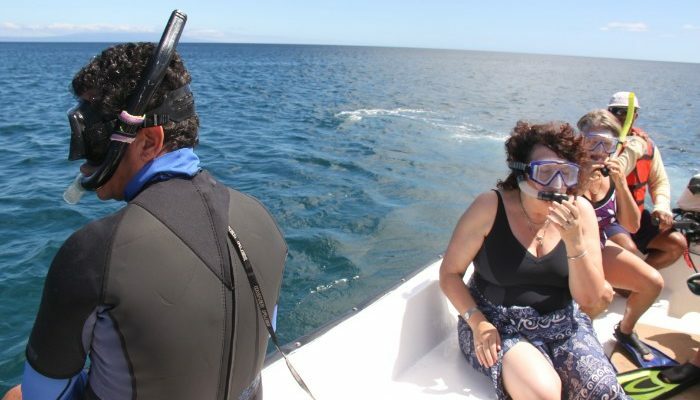 Temperatures sit at a comfortable mid-twenties; the water is a little cooler, so keen snorkelers might want to consider wearing a wetsuit, but the water is still comfortable enough to get away with regular bathing suits. Skies are generally clear, so you should have plenty of photo opportunities without contending with rain. The waved albatross chicks have finally hatched and are huddled in their nurseries while the parents go out to hunt. Galapagos sea lions are mating; males can be aggressive, so don’t get too close in your quest for the perfect photo. Galapagos Penguins are nesting; they are the only penguins in the Northern Hemisphere and have only one mate in their lifetime – true romantics. You might experience some light mist, wind and drizzle in August, but don’t let that deter you from visiting the Galapagos at this time of year. It’s generally a dry time of year, so you won’t experience any downpours like during the tropical months. This is the perfect time for dolphin- and whale-watching, so pack your cameras and binoculars and get ready to see some of Mother Nature’s finest work. It’s the start of the sea lion birthing season, so you should spot a few of the pups learning to swim. 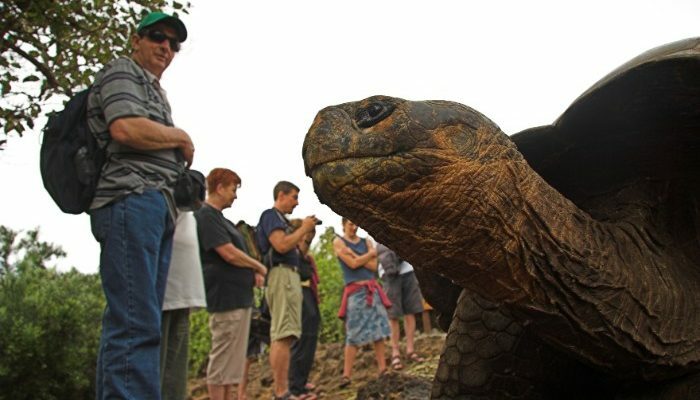 The giant tortoises are also returning to the highlands after laying their eggs. Often the coldest and driest month of the year, September is a great time for cool-weather lovers. It’s considered the low-season for tourism, which means you’ll have less boats and travellers to contend with. The cute, little penguins love the cold water, so they’ll be swimming and fishing to their hearts’ content. They’ll also be mating, so you’ll find them on the beaches as well as in the sea. 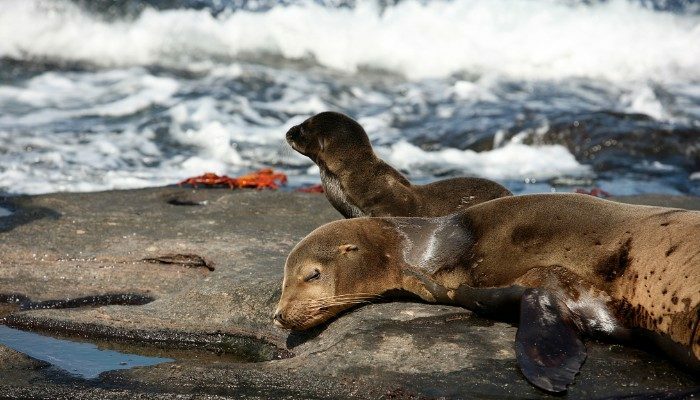 Sea lion pups will still be out and about in the water and the fur seals will just be beginning to mate. October will see mainly overcast, grey skies (which makes for the best photos) but the temperature is slowly rising. Some of the mist from the last few months will also start to clear, so you’ll get to enjoy some amazing sunrises. Image by Tamara Bizjak via Shutterstock. Baby boobies! That’s the highlight for October if you’re heading to Isabela and Espanola. The brightness of the birds’ blue feet indicates how healthy they are, so hopefully you’ll see plenty of bright blue-footed birds. There may be a few more rain showers in November as we inch towards the wet season, but you should still see plenty of sun throughout the day. The Humboldt Current from South America runs through the islands at this time of year, meaning the water can be chilly, but it also brings a fresh batch of nutrients, meaning many happy birds and fish will be on show. As mentioned, November is a good time for sea creatures. Now’s the time for green sea turtles to cosy up to their partner for mating season and there will be another opportunity to see whale sharks in the North-West. December is the turning point from the dry to wet season, so consequently it can be a bit of a mixed bag weather-wise. You might experience hot, humid weather with rain, or you could still experience cool, dry weather. The best advice is to pack accordingly – think sunscreen, rain jackets and layers of clothing. The iguanas are mating, the giant tortoises’ eggs are hatching and the waved albatrosses’ chicks are learning to fly. You’ve got a whole range of life-stages happening in the one month, so it’s a pretty festive way to end the year. Thanks to the early rains, many plants are beginning to bloom on the islands, making the whole region lush and green. 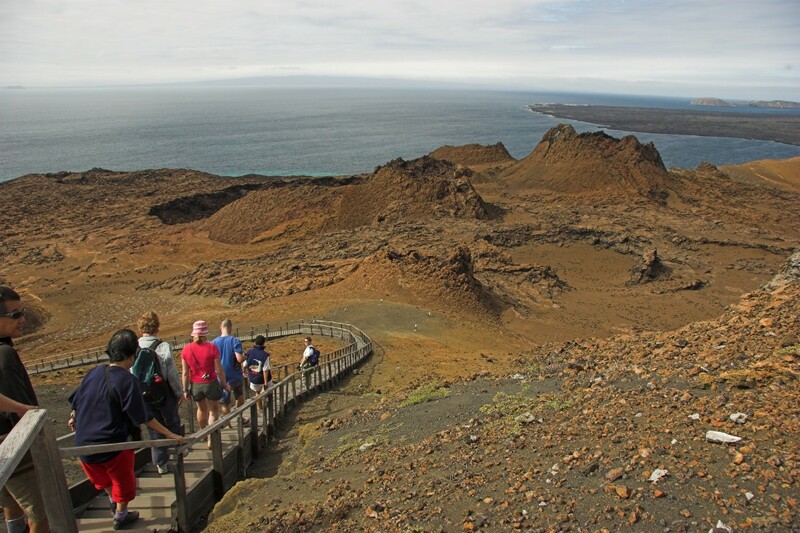 Do you want to visit the Galapagos Islands? It’s simple! 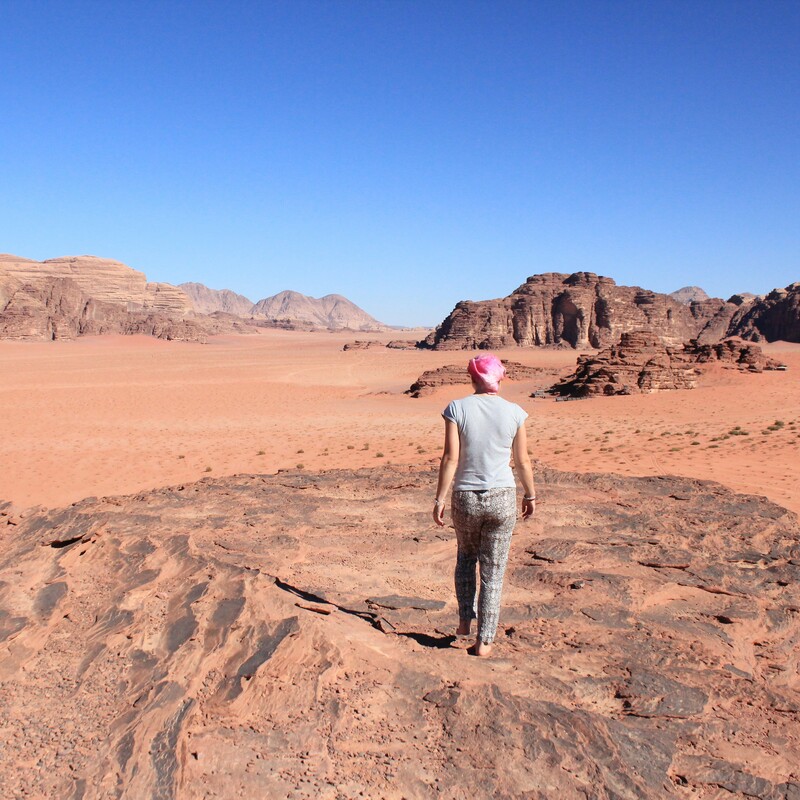 Just choose the time of year that appeals to you and book your adventure today. Hero image by James Frankham.